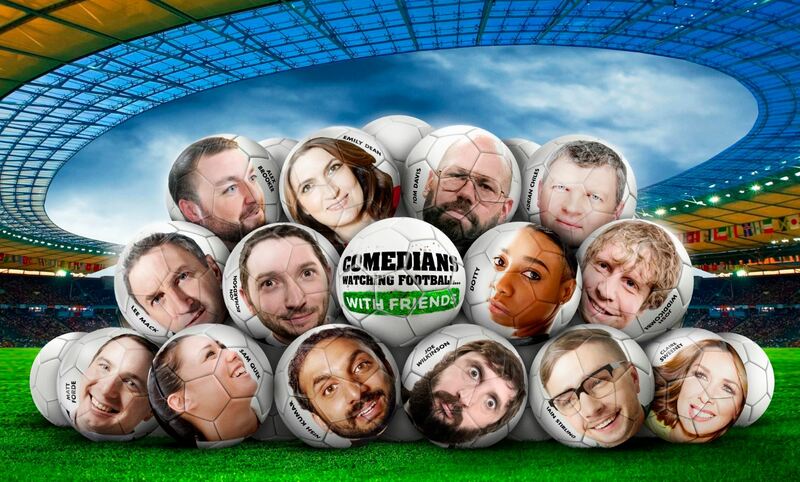 Comedians Watching Football With Friends is a brand-new topical comedy format produced for Sky One in the UK. Thanks to Sky’s unique relationship with the Premier League, this original production sees comedians, and friends, watch two of the big televised weekend matches while they offer sofa-situated analysis and generally chew the fat. Regulars during the series include: NISH KUMAR (Manchester United), JON RICHARDSON (Leeds United), EMILY DEAN (Arsenal), TOM DAVIS (West Ham United), MATT FORDE (Nottingham Forest), JOE WILKINSON (Gillingham), LEE MACK (Blackburn Rovers), JOSH WIDDICOMBE (Plymouth Argyle), ADRIAN CHILES (West Bromwich Albion) and IAIN STIRLING (Liverpool). Each game is recorded in two sitting room style studios simultaneously, reflecting what’s going on in living rooms up and down the country. With a live audience of partisan fans oohing, ahhing and laughing along, two comedians and one celebrity super-fan offer their thoughts on the game, or anything else, as the action unfolds. To view videos please contact distribution@avalonuk.com for a password.